What kind of return would you have to get in the stock market to make it worth the risk and gut-wrenching ups and downs? Would you put your life’s savings at risk for a 5% annual return? Or would you require at least a 7% return? Or maybe even a 10% annual return? If you’re like most people we’ve surveyed, you wouldn’t do it unless you thought you could get at least a 7% annual return over time, right? I hope you’re sitting down because this is going to floor you: According to a new study, the typical investor in equity mutual funds has gotten only a 3.88% annual return… over the last 20 years! Have you heard the phrase “nominal return“? That’s the rate of return on an investment without adjusting for inflation. Oops!! A 1.71% real average annual return for the last 20 years?!? The study did take into account the average fees and expenses you pay in these accounts. But it did not account for the taxes you’re going to pay if you’ve been saving in a tax-deferred account like a 401(k), 403(b) or IRA. And that’s going to devour at least 25%-33% of your savings, according to the Center for Retirement Research at Boston College. How did other types of investors fare over the last two decades? Answer: Even worse than equity mutual fund investors did. Much worse! The average investor in asset allocation mutual funds (which spread your money among a variety of classes) earned only 1.87% per year over the last two decades, but because inflation averaged 2.17% a year, they actually ended up losing 0.30% every year for 20 years. But the biggest losers were investors in fixed-income funds. They only managed to eke out a 0.22% average annual return, significantly trailing inflation and digging themselves deeper and deeper into a hole every year. This shocking data comes from the just-released 2019 Quantitative Analysis of Investor Behavior report by DALBAR, the leading independent, unbiased investment performance rating firm, and it covers the 20-year period ending December 31, 2018. If you’re scratching your head and thinking, “but I’m sure I did better than that,” the reality is that most investors don’t have a clue what return they’ve really gotten in their retirement accounts over time. The Bank On Yourself Authorized Advisors will have their clients get out all their annual statements and look at the numbers with them. They consistently find that people overestimate their returns by a large margin. Wouldn’t the Classic Definition of Insanity be to Continue Doing What Clearly Hasn’t Worked for the Last Twenty Years? If you wouldn’t be willing to put up with the stomach-churning unpredictability of the stock market for a 5% annual return over time, why would you accept a real annual return of less than 2% a year? This is a HUGE part of the reason the typical household nearing retirement has an average of only $135,000 in their combined retirement accounts, which will provide only a $600 per month income, according to the Federal Reserve Survey of Consumer Finances. That survey also showed that most households have little or nothing outside of the money in their retirement and investment accounts, which puts their entire life’s savings at risk in a market crash. 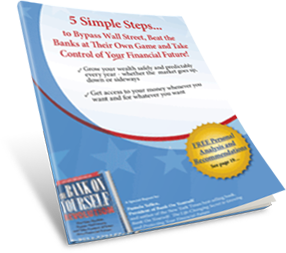 If you’d like to see how adding the Bank On Yourself strategy to your financial plan could help you reach your financial goals without taking any unnecessary risks, just request your free Analysis here now. There’s no cost or obligation, and you’ll get a referral to a Bank On Yourself Authorized Advisor who can answer any questions you may still have. Keep in mind that the only regret most people say they have about implementing the Bank On Yourself strategy is that they didn’t start sooner and didn’t put more into their plan.